With big profits and American Airlines becoming the third airline to be included in the S&P 500, it caps a comeback for the vaunted company. In a sense, a legendary iconic American company had bitten the dust. 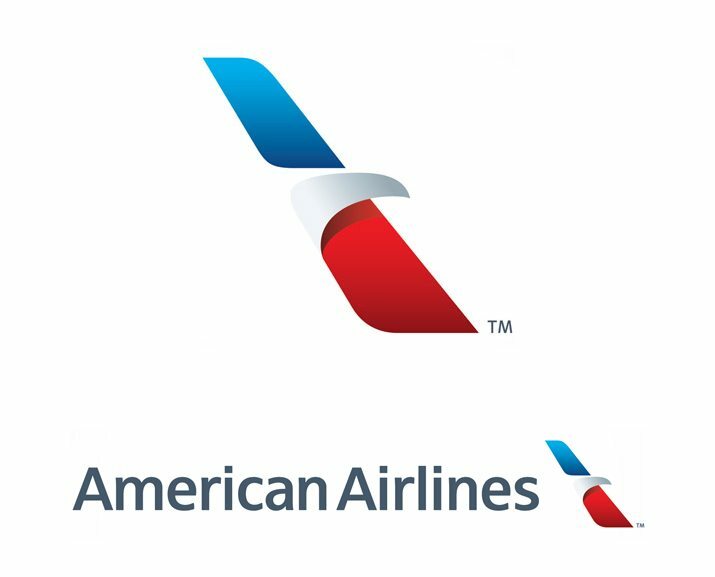 In a bid for sustainability, the American Airlines (AA) $11 billion merger with US Airways made it the world’s largest carrier. It’s been a stormy flight for AA. AA filed bankruptcy Nov. 29, 2011, just five months or so after ordering 460 single-aisle jets from Boeing and Airbus. Meantime, US Airways ordered 76 new Airbus jets. The merger is forecast to produce revenue and savings of more than $1 billion by 2015. The deal involved more than 900 routes, but only 12 of them overlap. AA has a long history of labor troubles and the merger presents quandaries in combining two union workforces totaling 96,000 people, as well as blending two information-technology systems and aircraft. Historically, such mergers aren’t successful. Consider that United’s poor on-time performance continued even after it merged with Continental Airlines. The problem extends to other industries. Look at Hewlett-Packard’s problems after its CEO, Carly Fiorina, forced a merger with Compaq. America isn’t the only country with failed mergers. Mergers in Canada have an 80 percent failure rate. Before merging, my sense is that none of the airlines took the precaution of consulting experts in human resources. But, the bankruptcy filing by AA’s parent company, AMR Corp., was an example of proper business planning to alleviate uncertainty. All struggling businesses and individuals might study AA’s plight to see if it’s applicable. At the filing, investors were fleeing – the company’s stock was barely above water at 32 cents per share. The company lost $471 million in 2010 on top of $1.5 billion in 2009 and $2.1 billion in 2008. That’s an indication that the company probably exhausted all options before its court filing – an honorable approach. Chapter 11 filing helped the company to manage risk for stakeholders – passengers, vendors, shareholders and employees. It’s the proper flight plan to restructure debt and expenses. When AA filed for Chapter 11, it flew a notable 9 million passengers that month. At the time, it had 88,000 employees to service a complex route system. So, the company is an important part of the nation’s and global economies. From the perspective of the Federal Aviation Administration, a flight plan is required for safety. A plane must have enough fuel to reach its destination. It must meet air traffic control requirements for routing and attaining the right height and speed to avert a collision with another aircraft. A properly handled bankruptcy serves the same purpose. Under federal protection, AA was able to continue to operate to serve passengers well on its 3,300 daily flights. The bankruptcy filing meant the company was required to be more strategic – to come up with management strategies for a successful turnaround. Fuel prices have dropped big time resulting in cost savings. Like the rest of the airline industry, AA had been coping with an uncertain economy, heavy competition, and explosive prices for fuel. The latter is a problem Alaska Airlines strategically solved in a Northwest partnership to counter high jet fuel costs. Like most airlines, AA was challenged in passenger service. Airline travel was once a special event for passengers. But no longer with a perception of uncaring service, lost baggage and flight delays on many airlines. The new AA will need motivated employees – to provide exemplary service with beguiling charm – like it did five decades ago when I took my first airline flight. Let’s hope the 96,000 merged workers get the message. Poor customer service and internal operations are responsible for at least 50 percent of a company’s profits or problems. Employees can be part of the solutions or problems. That includes hope the venerable airline comes up with a strategic plan to succeed. Stakeholders deserve a sound plan. FYI, if you’re struggling, too, there’s no stigma in bankruptcy for an honorable company. It’s best to take a sober look at your situation, and take appropriate action no matter how challenging. Step-by-Step Solutions for a Company Turnaround — Difficult economic conditions have exacerbated the financial woes facing many businesses. But business success is possible for companies suffering through red ink. Here are financial solutions that will help facilitate a company turnaround. 12 Tips for Profits to Keep Your Business Dreams Alive — Most businesspeople agree the economy continues to be challenging. Signs of a lingering downturn are everywhere. Business activity is slow. Governments at all levels report low tax revenue and are restructuring, and not spending. So what can you do? Strategies if Your Accounts Receivables Are a Problem — Increasingly, receivables are continuing to haunt businesses as their customers struggle in the much-awaited recovery. Here are some solutions. Here’s a great sports metaphor for business — the storied career of a legendary baseball player who overcame injuries and used fear as a great motivator. Thank you, Mickey Mantle. He played in an era of legendary baseball players, including Willie Mays, Ernie Banks and Henry Aaron. There were endless arguments over who was better — Mays or Mantle? As the greatest switch-hitting slugger in baseball history with 536 home runs, The Mick had the highest OPS+ (on-base percentage and slugging average) of all center fielders. The Hall of Famer played his entire 18-year career, 1951 to 1968, with the New York Yankees. Lightning-fast as a runner, he had outstanding bursts of speed: The highest stolen-base percentage, grounded into fewest double plays, baseball’s fastest runner from home plate to first base, and galloped like a thoroughbred in running down fly balls. Right-handed, he had a strong throwing arm from deep center field and was even a world-class bunter when the need arose. Before the term “walk-off home run” was used, he was No.1 with 13 game-winning homers. He was the American League’s Most Valuable Player three times and Gold Glove winner once. The Mick led the Yankees to 12 World Series and winning it seven times. He set several World Series records – 18 home runs, 40 RBIs, 42 walks, 26 extra-base hits and 123 total bases. Yet for all his successes, he admitted to having fear, which he often used as a great motivator (more on that later). He credited his father as his role model for teaching him how to overcome fear while growing up in Oklahoma. The Mick learned the game from him, a lead and zinc miner. Envisioning greatness for young Mickey, his father taught him how to switch-hit at the age of five. Despite working long hours in the mines, every night his left-handed father and his right-handed grandfather pitched to him for five hours. Tragically, his father died at the age of 39 from cancer just after The Mick made it to the major leagues. He always feared dying at an early age, too. So he played hard on and off the field. No pitcher could dominate him. When he connected, he hit the ball farther and harder than anyone. With one out in the 7th inning, The Mick came to bat as my brother yelled, “Come on, Mickey, hit one for me!” Seemingly on cue, our hero hit a screaming line-drive that narrowly missed us. He had suddenly tied the game. Note the following picture: As he circled the bases in his home-run trot, The Mick was noble — as usual — even as Koufax stared in disbelief at him from the mound. His dramatic home run had just shocked the Dodgers and their fans, but he didn’t celebrate. 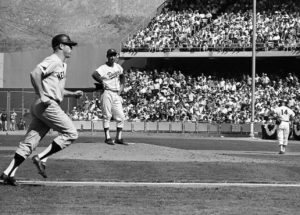 Nor did he taunt Koufax — he was focused on home plate — he still had a game to win. No. 7 had his share of strikeouts, but my recollection was that he was rarely caught looking at a called strike three. He never gave up. If he was called out on strikes he didn’t complain. He was never afraid to swing at the first pitch. He didn’t cheat himself. He swung hard. When he spotted a strategic opportunity by not swinging for the fences, even as a slugger he was legendary for seizing opportunities by drag-bunting. That was true in his later years after he lost his vaunted speed. Underdogs become successful entrepreneurs by creating a competitive edge. Success in entrepreneurship results from strong mental approaches. By 1964, The Mick’s legendary skills faded. Most players would have stayed on the bench. With a painful right shoulder from torn tendons, he no longer had the ability to make laser-like throws from center field. Surgery would wait for the off-season. With a bad knee, the kid from a rural town in Oklahoma, “the Commerce comet,” was no longer baseball’s fastest runner to first. However, relying on his experience and courage, he led the American League that year in on-base percentage with 35 home runs and 111 RBIs. He had batted .241 left-handed, and a stellar .421 right-handed. In that season’s Fall Classic — the St. Louis Cardinals vs. the New York Yankees — in game three at Yankee Stadium with more than 67,000 fans on hand, he had been switched to right field because he couldn’t run or throw well. Roger Maris took his place in center. As the game wore on, the Cardinals ran the bases at-will on The Mick. It got worse. In the 5th inning, the Cardinals tied the game at 1-1 when the ball skipped through No. 7’s legs. Oh, no! It was an embarrassing tragedy for the proud baseball player. As a young, passionate Mantle fan watching on television, I was heartbroken. But as the lead-off hitter with the score still tied in the bottom of the 9th, he got a chance to redeem himself. Could he overcome his eight innings of humiliation and deliver in the clutch? To pitch to him, the Cardinals brought in their best reliever: Veteran right-handed, knuckle-baller Barney Schultz, who had an outstanding 1.64 earned-run average and allowing no home runs in 30 games that year — practically unthinkable in baseball today. That meant The Mick would have to bat from the left side — strategically, his weakest because of his painful right shoulder and his season’s .241 batting average. From the dugout, The Mick didn’t waste time. He studied the pitcher warming up. Just a shell of his former self, the aching Mick gingerly trudged to the plate. The first pitch was low and outside. The Mick swung — the ball exploded off his bat — a towering moonshot above the third deck in right field. The sellout crowd went crazy. My eyes filled with tears. Game instantly over! Another walk-off home run as The Mick courageously came through in the clutch one more time. So his method was to imagine success — a great lesson for high performance. Like many baseball players, most entrepreneurs already have the basic attributes in knowledge and talent. But for success in entrepreneurship, a strong mental approach provides the competitive edge. Practice imagery. Instead of wringing your hands during adversity, envision success. Think as a maverick – with independence. Strong entrepreneurs listen to others, but follow their instincts. Know when to act — just like when Mickey decided to swing at a pitch for a home run. Be passionate. You must love the game of business. Be a trustworthy leader. Make sure others are confident in your consistent performance. Focus on values. Do not compromise on principles. Do the right thing. Play and swing hard on every pitch. Stay flexible. Have a game plan, but be prepared to alter it. When necessary, despite his prowess, the Mick didn’t hesitate to bunt. Focus on timely strategy. What you do is as important as picking the right time to do it — be a clutch player. Practice stewardship. Be a good steward of your business. Work hard and be resilient. Take batting practice. Continually evaluate and work for improvements. Be frugal. Don’t waste your energy and resources, but invest to create opportunities for growth. Have faith. Do The Mick’s affirmative thing. Remind yourself how talented you are. Be confident in your abilities. Know you’ll succeed if you work hard. When you fall down, pick yourself up. Persevere. Never give up. As they say in boxing, answer the bell. “Meekie, I’m sorry I have to do that.” That’s what pitcher Pedro Ramos said to Mickey after hitting him with a retaliatory pitch – the next at-bat, The Mick hit a homer off the façade at Yankee Stadium. Admit mistakes. If you make a mistake, flaunt it. But prepare for opportunities to redeem yourself. You’ll get a 9th-inning opportunity just like No. 7. Keep an open mind. At strategic times, just because something is outside your comfort zone, consider taking educated risks. Consider bunting instead of swinging for the fence. Find a good mentor. Seek someone successful in ways you want to become. Pass it on later when you get the chance, just like Mickey learned from his dad. Be charitable. There’s always a worthy cause or people who deserve your consideration. Mickey always signed autographs even after a tough day at the office. Celebrate your victories in-stride with style. Don’t be gauche. Relish your victories but be classy about it. The Mick always looked down or away from the pitcher after every home run. He acted like he’d accomplished the feat before. Be loyal. Loyalty to the organization is of paramount importance and so is to the people who are good to you. The Mick sometimes quibbled with management at contract renewal, but he stayed loyal as a Yankee for 18 years. Again, thank you, Mickey Mantle.